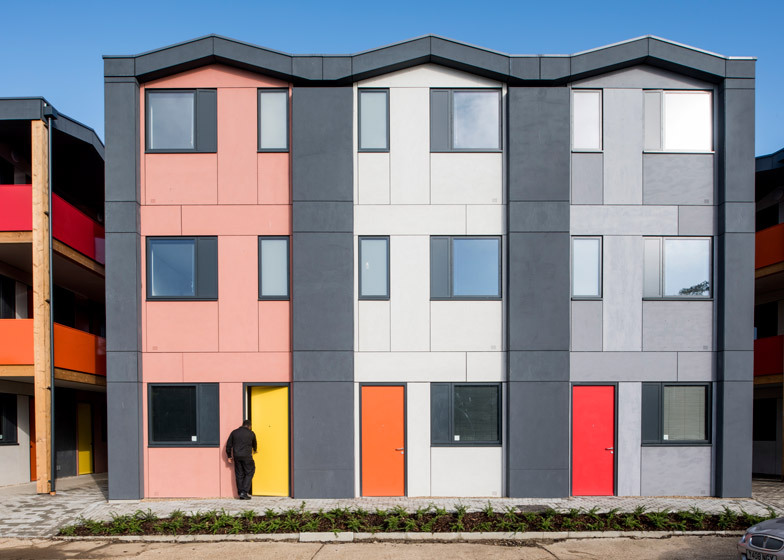 Designed for charity YMCA, this factory-building housing scheme by Rogers Stirk Harbour + Partners will provide accommodation for 36 homeless young people in Mitcham, south London (+ slideshow). 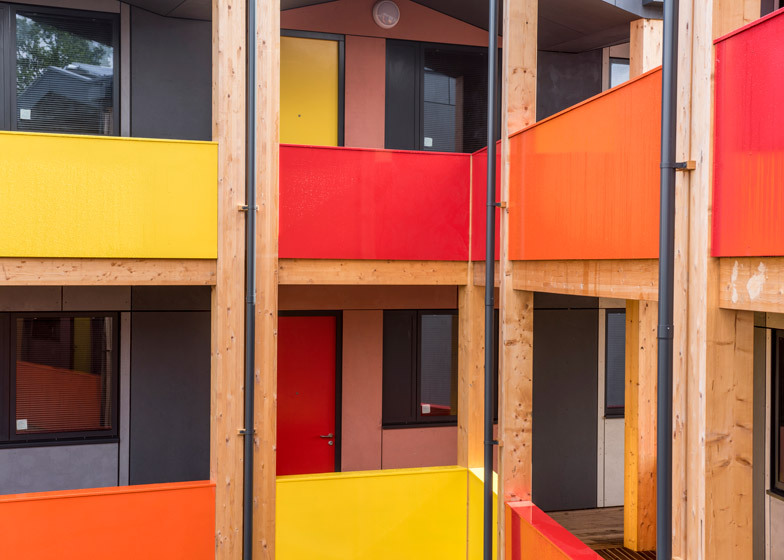 Rogers Stirk Harbour + Partners' modular Y:Cube scheme for the YMCA was designed to be easily assembled and transported, so blocks can be moved between temporary sites in the capital. Named George Williams Court after YMCA's founding member, the complex comprises 36 single-occupancy apartments. 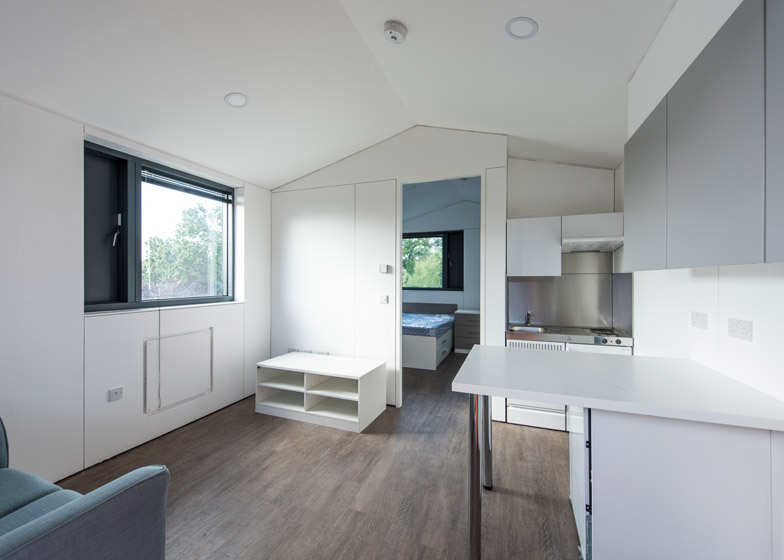 Each of the 26-square-metre units has a combined living room and kitchen and a separate en-suite bedroom. 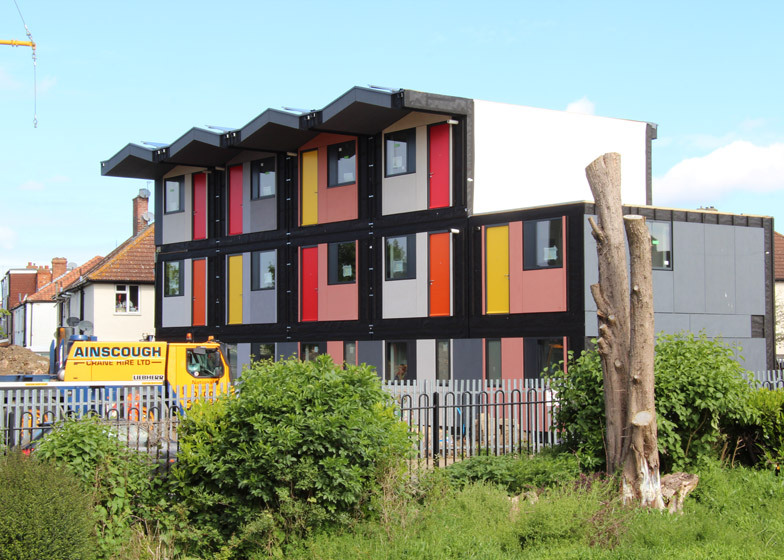 The brightly coloured blocks are stacked one on top of the other at a previously vacant plot between a play park and rows of suburban housing in Mitcham, a district within the London borough of Merton. 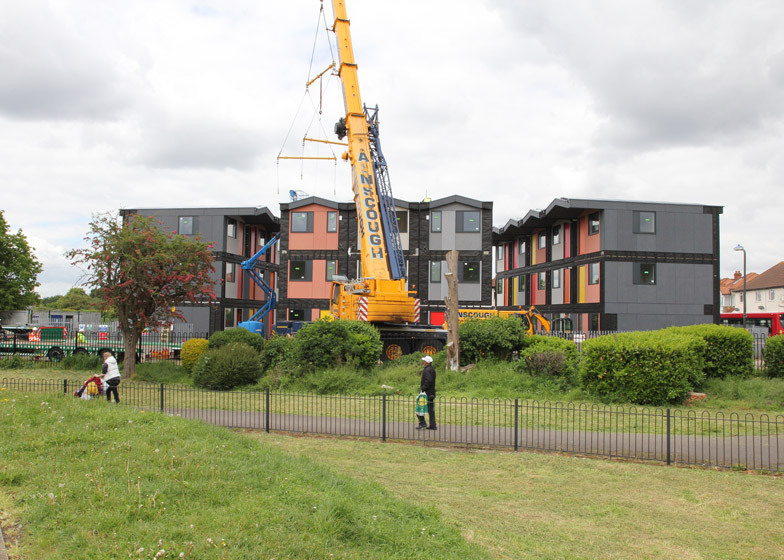 Tenants drawn from YMCA hostels and the local authority housing list will begin to move in this week. 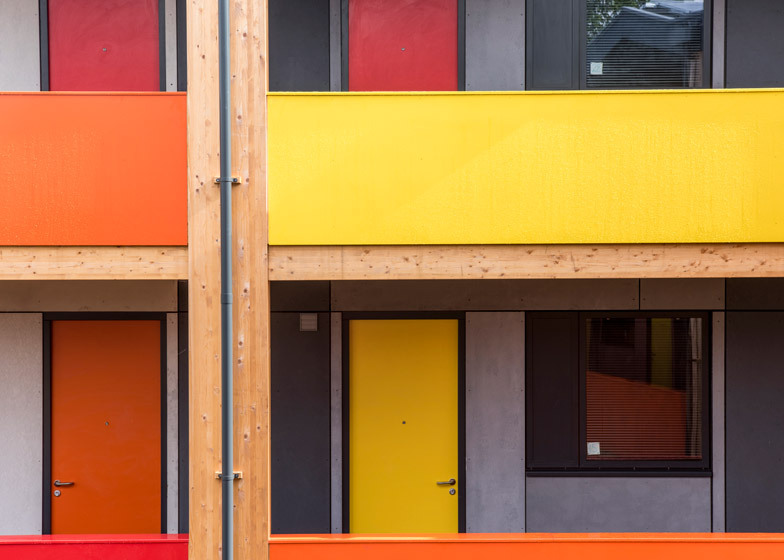 "We've been failing to build enough housing," said Richard Rogers at the opening of the scheme earlier today. "The supply lags behind demand and buying becomes ever more unaffordable." Rogers claims there is space to build a further half a million houses on disused brownfield sites across the capital. 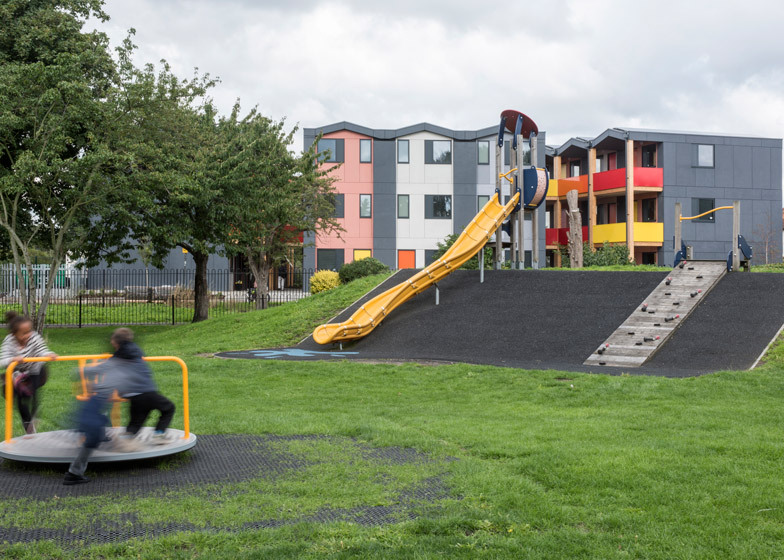 "We need to let local authorities build more, to make the most of their land, create the communities that we need and put value back into building more affordable social housing," he said. 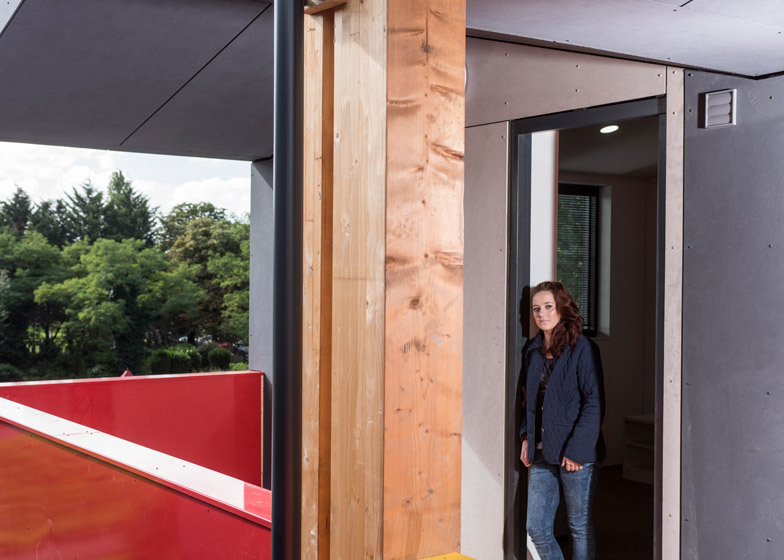 "We need to unleash similar building innovation across the capital or the same old business model will cause us to stay in the same old housing crisis." Each unit costs between £30,000 and £35,000, and takes about a week to construct in the Derbyshire factory – and the same to assemble on-site. The factory construction mitigates the costs and time associated with running a conventional bricks-and-mortar building site. 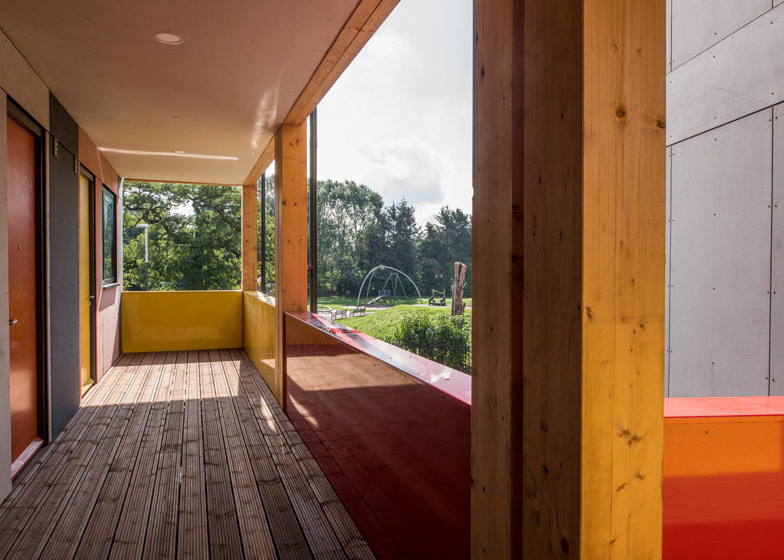 "They're not cheap properties – these are solid things – I could argue that they're more robust than mass-market housing of equivalent scale," Rogers Stirk Harbour + Partners' Ivan Harbour told Dezeen. "All the costs of management disappears when all you're doing is bring in some blocks and putting them one on top of the other." 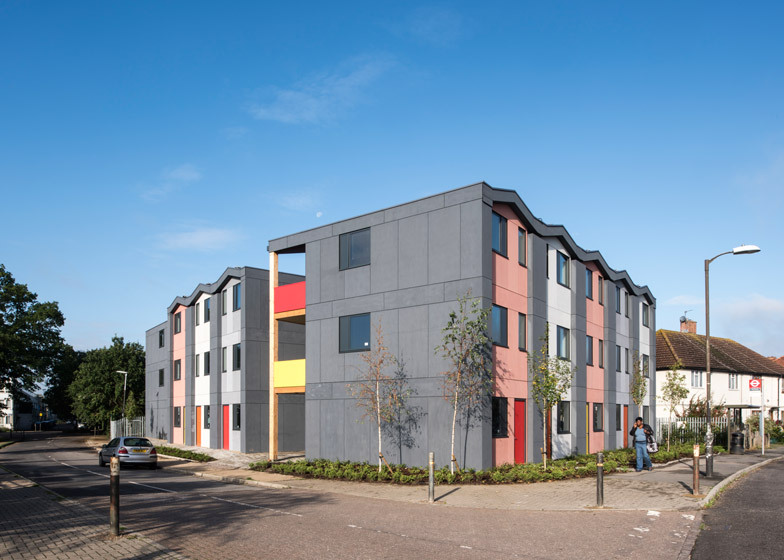 Rent is calculated at 65 per cent of the local market value, taking into account site lease and construction costs – equating to an outgoing of approximately £150 per week for each resident in the Mitcham scheme, which sits on charity-owned land. This setup is designed to allow residents to put money aside to save towards a purchase in the private housing sector. "In the end it's all about keeping the rent right down," said Harbour. 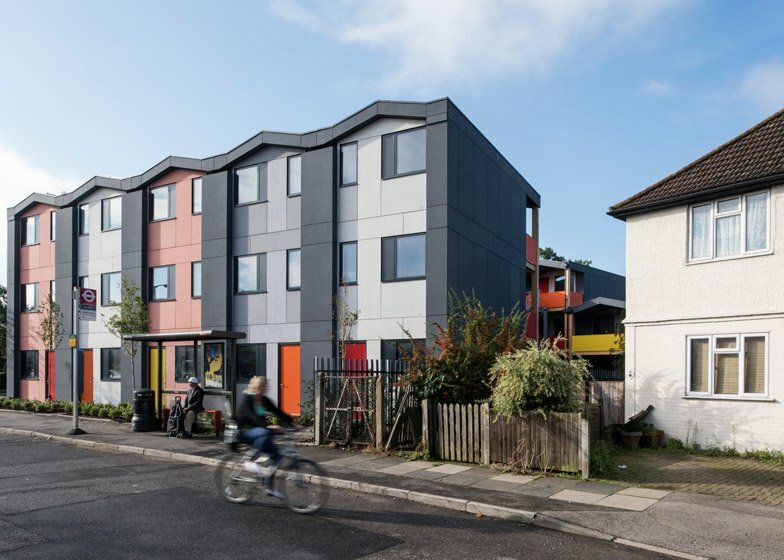 "The principle here is to minimise people's outlay for their rent so that they can afford to save and eventually get on the more conventional housing ladder." 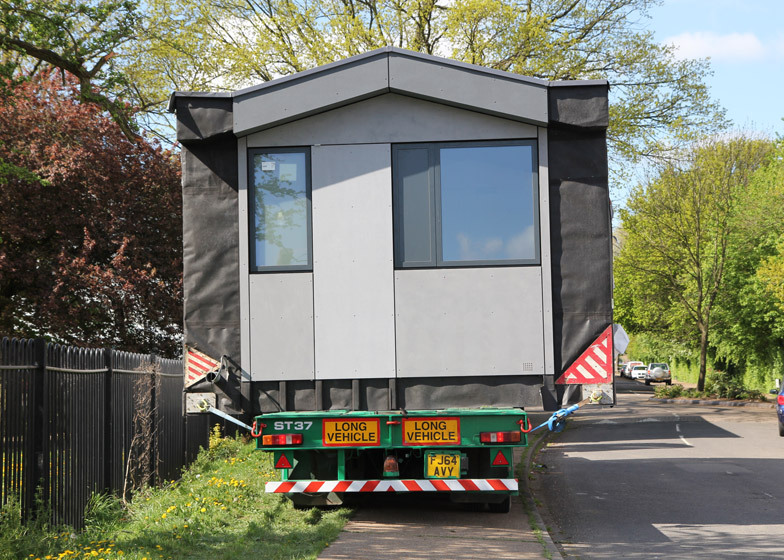 The dimensions of each unit – ranging from the shallow pitch of the roofs to the width of the rooms within – are determined by the maximum cargo of the wide-load lorry used to transport housing from factory to site. The container-like spaces are craned from the lorry and stacked one on top of the other, culminating in a row of pitched-roof blocks. 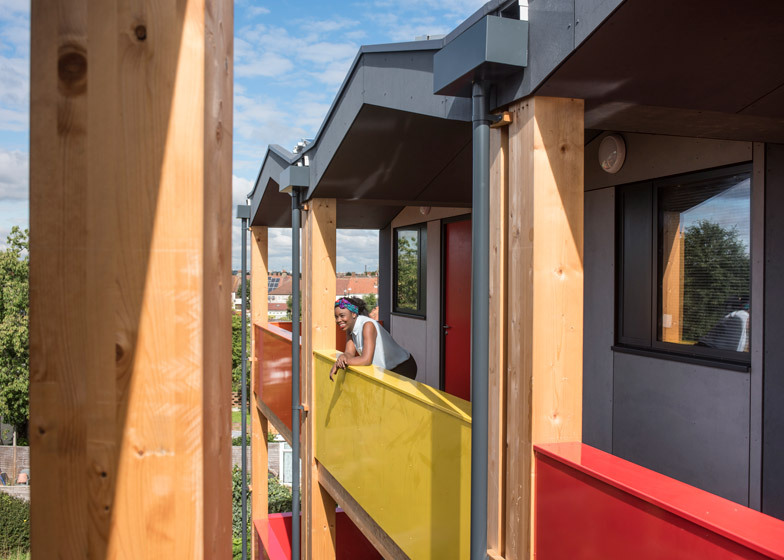 Wide timber decks provide outdoor space around the perimeter of a grassy courtyard in the centre of the Mitcham site. "The word prefab is much maligned," said Harbour. 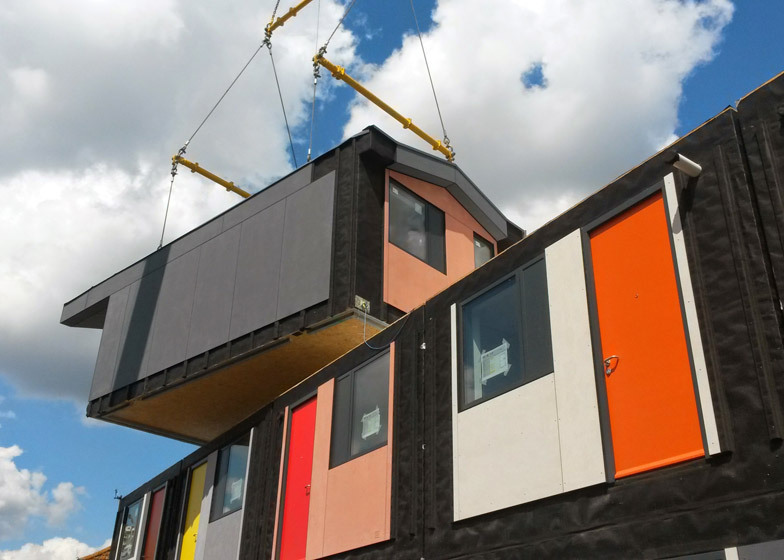 "In the commercial sector we're making prefabricated buildings all the time, but the conventional mass-market residential sector is working block-by-block and brick-by-brick so when it comes to quality for low costs theres real opportunity to have off-site manufacture become very important." 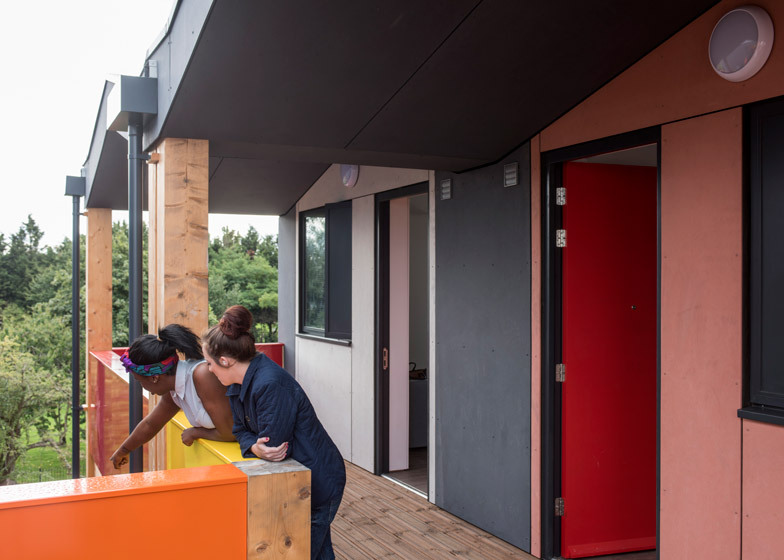 Rogers Stirk Harbour + Partners is also working on redeveloping the YMCA's headquarters in Wimbledon, and a similar scheme in Lewisham aimed at families and startup businesses. Photography is by Grant Smith.